All photos on this website are by Ellie Clin unless otherwise noted. Ellie Clin is an elementary educator in Toronto, Canada and a Grosvenor Teacher Fellow on expedition to Antarctica in December 2015. I grew up in Waterloo, Ontario and spent my summers on Lake Manitou, Manitoulin Island, the largest lake on the largest freshwater island in the world. I completed my undergraduate degree at Queen’s University in Kingston, Ontario, where I focused my studies on young children’s reading development and graduated with the Medal in Linguistics. I received a Master’s of Arts in Child Study & Education from the Jackman Institute of Child Studies, University of Toronto, and have since acquired a number of additional teaching qualifications in subjects such as Environmental Education and Native Studies. I currently teach in Toronto at an alternative public school. I am passionate about taking my students outdoors to learn about their local community and their connections to the wider world. Through hands-on, inquiry-based projects like collecting milkweed seeds to grow a monarch way station, participating in cultural ambassador programs with students around the world, and creating short films to promote environmental awareness, I hope to inspire my students to appreciate, reason, and communicate about our world. Whether boarding down volcanos in Nicaragua, climbing sand dunes in Morocco, or riding the Tokyo subway during rush hour, I love to seek out adventures that expand my world view and inspire my teaching. 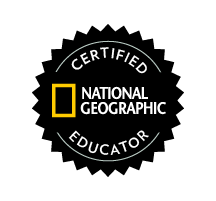 I am thrilled to represent National Geographic and Lindblad Expeditions as a Grosvenor Teacher Fellow, and hope that it will inspire incredible learning, stewardship, and a lifelong love of nature for my students.